After my recent post on early Bengali science fiction, Desiknitter suggested in a comment that Sultana's Dream (1905) by Rokeya Hosain ought to be on the list. And she was right: Sultana's Dream is an intriguing example of a feminist utopia -- an imagined world where women are socially and politically dominant over men, and that dominance is seen as natural. Other examples of it include Margaret Cavendish's The Blazing World and Charlotte Perkins Gilman's Herland (1917). Rokeya Hosain led a fascinating, activist life, which bears some looking into. Oh, and the story alludes to a fascinating problem in optics -- parabolic mirrors used as weapons -- which I'll talk about a little at the end. Rokeya Hosain wrote Sultana's Dream only a short while after learning English. She and her sister showed a remarkable early proclivity for books and ideas even though, as girls, they weren't actually allowed to learn how to read (eventually, Rokeya's sister was forced to give up the habit by embarrassed family members). Hosain was married in a 'love match' at the age of sixteen to a progressive Bengali Muslim, who fortunately supported women's education and taught her English. Rokeya wrote Sultana's Dream, the story goes, when he was away on business. Her goal was to impress him with her skill in English, and by all accounts she more than succeeded. The biographical note in the Feminist Press edition of Sultana's Dream describes his reaction to the story: he read the whole thing standing up, and uttered, "A splendid revenge!" The story was soon published in a Madras journal. He meant, of course, "revenge" on men for the repressive system of gender-segregated Zenana (aka 'Purdah'). For Rokeya Hosain's Sultana's Dream is set in a realm where women rule and men are kept away in segregated quarters: the Mardana. This is Hosain's coinage; it comes from the Urdu word 'Mard', meaning 'man'. The full text of Sultana's Dream is available here, if you have a few minutes. It's about 15 pages long. "As a matter of fact, in your country this very thing is done! Men, who do or at least are capable of doing no end of mischief, are let loose and the innocent women, shut up in the zenana! How can you trust those untrained men out of doors?" "We have no hand or voice in the management of our social affairs. In India man is lord and master, he has taken to himself all powers and privileges and shut up the women in the zenana." "Why do you allow yourselves to be shut up?" "Because it cannot be helped as they are stronger than women." "A lion is stronger than a man, but it does not enable him to dominate the human race. You have neglected the duty you owe to yourselves and you have lost your natural rights by shutting your eyes to your own interests." Here, Hosain is playing with conventional religious and cultural justifications for the seclusion of women (the paradox of locking up someone for their protection from yourself; shouldn't you be the one who's locked up?). She's also alluding to a conundrum that all feminist utopias that have any men in the picture at all have to address: the "brute strength" problem. "The Lady Principal rose again and said, 'before we go out the men must enter the zenanas. I make this prayer for the sake of purdah.' 'Yes, of course,' replied Her Royal Highness. "On the following day the Queen called upon all men to retire into zenanas for the sake of honour and liberty. "Wounded and tired as they were, they took that order rather for a boon! They bowed low and entered the zenanas without uttering a single word of protest. They were sure that there was no hope for this country at all. "Then the Lady Principal with her two thousand students marched to the battle field, and arriving there directed all the rays of the concentrated sunlight and heat towards the enemy. "The heat and light were too much for them to bear. They all ran away panic-stricken, not knowing in their bewilderment how to counteract that scorching heat. When they fled away leaving their guns and other ammunitions of war, they were burnt down by means of the same sun heat. So the men went into the Zenana to protect the women's modesty! After the battle was won, the men voluntarily agreed to stay in seclusion in the 'Zenana', while women ruled the Kingdom, which came to be known as Ladyland. Using parabolic mirrors in a military battle is a great way to get around the brute strength problem. It's clever, it's not too hippy-dippy (the women didn't simply "charm" the enemies to go away), and it's actually sort of scientifically plausible. Brief scientific digression: As I recently learned from the television show MythBusters, rumors about mirrors being used as weapons go back to Archimedes' time, where people say such weapons may have been used in the Siege of Syracuse (215 BCE). Mirrors shaped into a parabola can focus the sun's rays on a single point, setting even thick pieces of wood aflame. Conditions have to be right, and the mirrors have to be focused just so, but it does work. The MythBusters tried to make their own fire-starting mirror a year ago, and concluded that the story about the mirrors being used as weapons must be false. But physics class at MIT designed a version of it that worked, even using bronze mirrors (the ancient Greeks didn't have flat-pane glass, obviously, so glass can't be used as a material). Even so, the myth of Archimedes' burning mirrors is probably false, since the first few generations of historians who wrote about the siege of Syracuse never mentioned it. The first mentions of the phenomenon only started appearing almost 800 years later. The counterpart to Sultana's Dream is The Secluded Ones, Hosain's direct consideration of how the Purdah system worked in the real world of her Bengali Muslim society. It's a pretty angry account, and certainly less imaginative than Sultana's Dream. But it's the product of a lifetime of struggle with her society. Her husband, who died early, left her a considerable sum meant specifically to enable her to start a school for girls, but she was forced to shut down the school she opened in the town of Bhagalpur because her husband's family didn't approve. 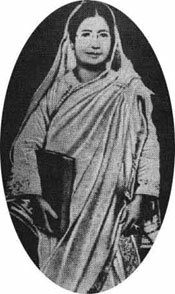 Hosain had better luck in Calcutta, where she was able to find a space, two other teachers, and plenty of students. But overall, the Bengali Muslim community of her era really didn't encourage education for girls, and she was, in a very real way, alone in her struggle. And though she wrote forthright feminist stories like Sultana's Dream and polemical works like The Secluded Ones criticizing the treatment of women, Hosain herself wore a version of a Burqa throughout her life (see the photo above). Incidentally, the school Rokeya Hosain founded apparently still operates in Calcutta. In Bangladesh, December 9 is "Rokeya Hosein day." Mmm...a version of the Burqa? No. All upper class Bengali women, Hindu and Muslim, dressed that way. Thanks (also to Desiknitter) again, for a great post. This particular one was unknown to this Bengali. All her life she herself used the burqa when appearing in public. In her schools and among her friends and relatives, she covered her head by the anchal of her sari (see frontispiece [which uses the same photo I'm using]), following the fashion of other educated women of her time. Maybe Rousham Jahan is wrong in calling it a 'burqa'? Or maybe it really is more conservative than other traditional Bengali saris. Look closely at the full covering on the arms -- was that necessarily standard? I'm impressed that her theory of the mirrors as weapons actually might work! I'm also curious about Hosain's reception in both regions of Bengal: a couple of Calcutta bengalis I have spoken to (otherwise very well read in Bengali literature) were totally unaware of Hosain, but a friend of mine from Dhaka knew of her as a famous social reformer. The way I read Jahan's description, Hosain "did" wear a traditional burqa in public. In private among friends, family and the confines of her "all girls" school, she appeared as in the photo - a common dress mode among ALL upper class Bengali women. The long sleeves are an extra layer of modesty but more a personal choice and not necessarily a reflection of a woman's religious background. Given the greater conservative nature of the Muslim community, Hosain's choice was understandably the longer version. What I remember from old family albums, women in my grandmothers' generation - all Hindus, variously sported short, long and three quarters length sleeves. There is some speculation in casual history that the ghungat or the custom of covering the head or the entire face among Hindu women is indeed based in the Muslim purdah. The practice is widespread in northern, central and parts of eastern India where Muslim rule and influence were prevalent. In Maharashtra, South India, the north east and tribal regions, where Muslim cultural influences were absent or limited, women do not cover their heads. You may have noticed that Maharashtrian and South Indian brides do not bother with a ghungat even during wedding ceremonies. In north Indian and Bengali weddings on the other hand, it is de rigeur. If true, then a ghungat is indeed a form of the burqa. Just curious. Is there any mention of women covering their heads in ancient Indian classics? For example Kalidasa's poems, where women's physical beauty and manner of dress are described in detail and with loving attention. What about the Kaama Sutra? Surely some of your informed readers might know. ruchira, u raise some interesting questions regarding women's dress. unfortunately, i am not one of those 'informed' readers u speak of, but i was travelling in india recently and went to several places of historical significance which are full of stone sculptures. from what i noticed, there was on eveidence of women (in those sculptures) covering their heads. i looked thru my photos and again i cant find anything to suggest the historic equivalent of ghungats or burqas. of course, the places i went to were all in the south- hampi (15th century vijayanagar empire), madurai (17th century nayaka dynasty) and nagarjunakonda (2nd century buddhist empire). The first time I read this story (which was part of a course that I took in college), I thought it was pretty kiddish and lacked much literary merit. But as we discussed this further in class, I realised that it wasn't so bad after all and was actually kind of revolutionary (even in the present times). The paradox of the zenanas pointed out by the story was one of the things that really made look up to this story in the end. Just curious. Is there any mention of women covering their heads in ancient Indian classics? For example Kalidasa's poems, where women's physical beauty and manner of dress are described in detail and with loving attention. What about the Kaama Sutra? This is a really interesting research question. I myself haven't seen any references to head-covering, but this is really one for the anthropologists. I might email some friends and see if anyone knows anything. Is there any mention of women covering their heads in ancient Indian classics? Not in the Mahabharata, or the Ramayana, or even Kalidas. I have read the first two in Sanskrit, and Kumar Sambhavam as well, and there is no mention of women covering their heads. In fact what you find are elaborate descriptions of elaborate hair-dos. The sign of intimacy was undressed hair, which is clearly mentioned, and the formal dos were a necessary part of dressing for public view. Could Du Bois have been aware of this aspect of Indian literature when he was working on Dark Princess?